Looking For Paradise In Paradise? Try The Sleeping Giant Rainforest Lodge! Living in Belize has its advantages, but sometimes throws a wrench into life, as we in Central America know too well. I mean you’d think when a special occasion comes up, there would be plenty of options to surprise a loved one, right? Wrong. Such a situation recently happened as I sought a surprise adventure for my wife’s birthday. Here we are, living the good life on one of the most gorgeous beaches in Belize. We can walk to world-class beach restaurants and bars from our home and have visited all the islands and most resorts here. So where the hell can I take her for a romantic surprise birthday where she hasn’t been before? I was wracking my brain when the light bulb flicked on so bright it almost blinded me! 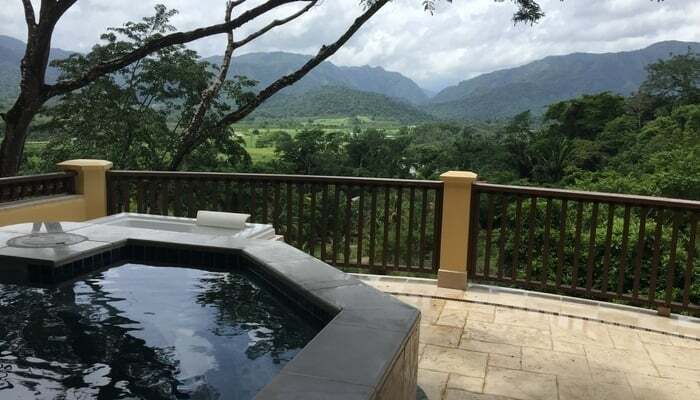 There’s a luxury resort near Belmopan where we’ve eaten lunch before, but never stayed at, because of the price. At almost $500 per night, with a three-night-minimum stay, the Sleeping Giant Rainforest Resort would blow my monthly cost-of-living budget. But thinking of my wife, I called them anyway, asking if they had any specials going on right now. As luck would have it, they were offering 50% off their room rates and told me they were good with waiving the three-night rule. BAM! Within minutes I had reservations for one of their mountain view suites. Check-in was a pleasure, with an open-air front desk surrounded by exotic plants and juice and coffee offered. Within a few minutes we were climbing the 78 (I counted) steps to our suite above the tree canopy. Inside we found a king bed facing a wall of windows with spectacular views of Sleeping Giant Mountain and the valley and river below. 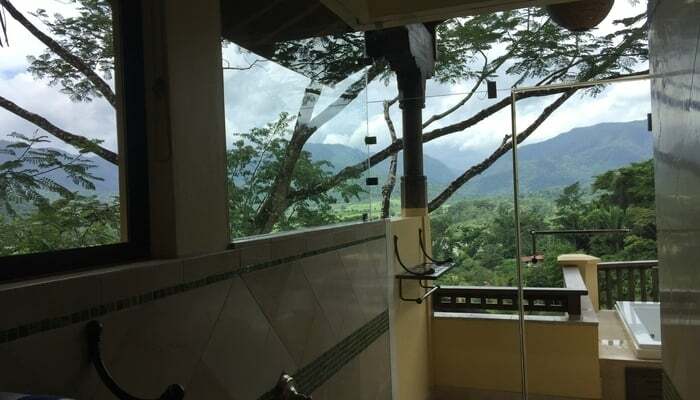 We checked out the impressive open bathroom with its glass wall “outdoor” shower. Finally, there was the massive deck with lounge chairs and private jacuzzi and plunge pool. My wife informed me we were not leaving the room for three days! We spent the day sipping champagne, soaking in the pool, relaxing, and loving life. We still had dinner in the Grove House restaurant below to experience. I had made reservations for 7pm for us, telling them it was my wife’s birthday. When we arrived, they gave us a special table for two, on a small private deck, with candlelight and roses everywhere. We were both emotional, because like I said, living in Belize, it’s difficult to spring something this special on your mate, and I did. Dinner impressed us more than all the excellent reviews I had read. My wife’s lobster was perfect, and so were my pork chops. The wine flowed, two bottles if my memory is correct, from an excellent selection. We’d stopped here a few times before for lunch as Sleeping Giant is right off the Hummingbird Highway, which we use all the time. Each time they’d asked us when we would come back for a stay and to enjoy dinner. The employees were happy that we finally made it, and so are we. We both agree that we will return for an extended stay a few times a year because it was that special for us. Gary Peterson lives on the Placencia Peninsula, Belize, where he writes books about Central America and the Caribbean. Read more of Gary’s work on his blog.